Excitement! A new project! We recently got funding for a cool project that combines art and science, and have now started to work on it. We plan to document the two-year process in various ways, including posts in this blog. Our project, ‘Social eMotions’ combines movement research, psychology and contemporary dance. We are funded by the Kone Foundation, which is very exciting for us, as these grants are highly sought after and we are proud to be among the recipients, alongside the crème de la crème of Finnish arts and humanities! According to their definition, they fund “bold initiatives” in research and in the arts. We have five people in the team. The science crew consists of me, Klaus Förger and Maija Niinisalo, and we have worked together on previous behavioural synchrony projects. 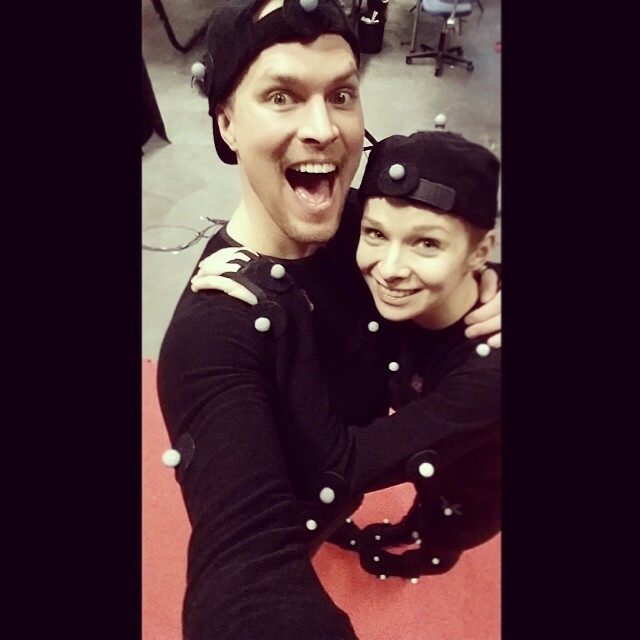 Our choreographer/dancers are Jarkko Lehmus and Johanna Nuutinen. The aim of the project is to study social emotions, how they are expressed in body movements and how they are perceived. Our choreographers create short scenes that express various emotional dynamics in contemporary dance. We record them in 3D motion capture, so that we can analyse the kinematics corresponding to each emotional process (feeling pride or shame, emotional contagion etc.). We can then use movement synthesis to modify the movements and create custom animations of novel encounters between the dancers. The plan is to conduct experiments and show a bunch of these animations, both the original and modded ones, to people and ask for their responses to them: what kinds of emotions do the animations express or even elicit in the viewers, could they recognise the emotional processes, what if the movements were altered? We are currently getting ready to record a bunch of these encounters in emotional movement. Jarkko and Johanna have been working in a studio, and they have generated a short choreography, and modified it to serve as the basis of these various emotional scenarios, where one person’s pride meets the other person’s shame etc. These are times when we need to remind ourselves that we were chosen to be among the bold ones–otherwise it is quite scary how many difficult decisions we’ve needed to make in choosing the emotions, scenarios, not to mention all the technical details. And yes, boldness in research means you don’t know in advance what the results might be, or even if you’ll have any. But this is one heck of an expedition and I’ve already learned loads, and the collaboration with artists is very fruitful. This entry was posted in General, research, Social eMotions and tagged boldinitiative, contemporary dance, dance research, kinematics, Kone Foundation, Koneen säätiö, motion capture, project, research, rohkeatekijä, Social eMotions by Tommi Himberg. Bookmark the permalink.